See clearly, drive safely with the New Michelin Optimum XT Beam Wiper Blade. 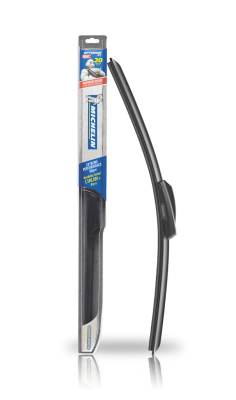 The MICHELIN Optimum XT wiper blade is built tough for durable wiping performance in ALL weather! The curved framesless design has infinite pressure points so it adapts to the curvature of your windshield for better surface contact. The EZ Lok connector system allows for installation in minutes. Durability tested to 1,500,000 million wipes. Durability tested to 1,500,000 million wipes. Curved Frameless Beam Design provides even quiet wipe pressure for smooth quiet wipes and improved visibility. EZ Lok Connector System for quick and easy replacement in minutes. Aerodynamic Design with built in spoiler grips windshields under the toughest conditions. Premium Rubber with Dura-Glide Coating for smooth, quiet streak free wipes. Built Tough for durable wiping in performance in all-weather heavy rain and extreme heat. 7926 - Michelin Optimum Xt Wiper Blade 26" 7919 - Michelin Optimum Xt Wiper Blade 19"